-This Song Will Save Your Life by Leila Sales: I LOVED Past Perfect, I'm really excited to read this!! -Less Than a Gentleman by Kerrelyn Sparks: this will be my first book by this author, it really sounds like my kind of romance! -Catherine by April Lindner: I'm actually part of a blog tour for this book, I'm always up for a classics retelling! -Never Fade by Alexandra Bracken: EEEE! ALL THE EXCITEMENT!!! Seriously, I never expected to love The Darkest Minds as much as I did, but it was AMAZING and I cannot wait to read the sequel!! -The Moon and More by Sarah Dessen: this will be my first ever Sarah Dessen book, I've heard so many good things about her writing! -The Gatecrasher by Madeleine Wickham (AKA Sophie Kinsella): this was a total bargain at my local bookstore and I love her books! -Sapphire Blue by Kerstin Gier: so I still need to read Ruby Red, I HAD to pre-order the paperback because of reasons! That dress is gorgeous! -Once Upon a Tower by Eloisa James: I'm fully on the Eloisa James bandwagon and this sounds really cute! 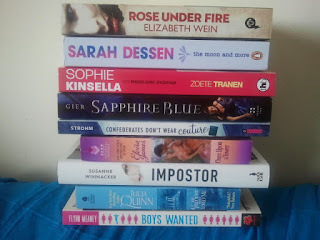 -Impostor by Susanne Winnacker: seriously, I'm DYING to read this book! It sounds so good! I loved The Viscount Who Loved Me! It's my favorite Julia Quinn book...And I had no idea April Lindner wrote another book. I loved her book Jane! Imposter is one I want to read. Can't decide on The Darkest Minds. Great haul! The Darkest Minds was SO GOOD! I totally fangirled over it! I just read The Darkest Minds and loved it. You're so lucky to have an e-ARC of Never Fade! The Boy Recession (seriously, why would they change the title?) 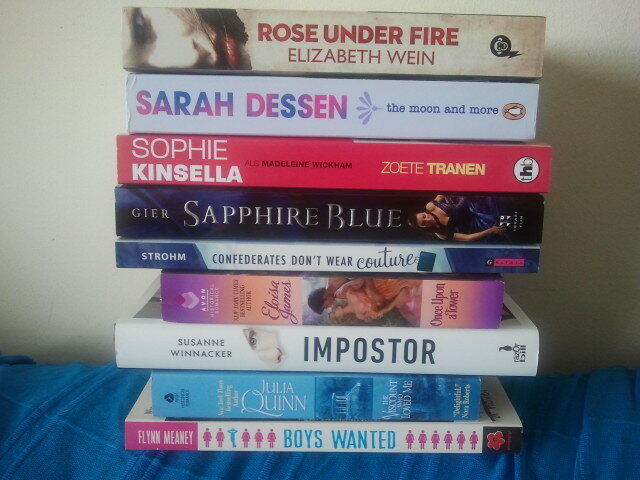 and Sapphire Blue are both in my TBR pile. Hey, B&B Crew, come link up your IMM on MPB! The Viscount Who Loved Me is among my two or three favorite Julia Quinn books! I hope you enjoy it, and all the other great books in your haul. This Song Will Save Your Life is sooo good! Hope you love it too. Now I need to catch up on Past Perfect :) Can't wait to hear what you think of The Moon and More. Love to read Dessen books in the summer. Look at all of those delightful books! Yay! Your comment about the dress on Sapphire Blue made me giggle, that's totally what I thought! I am loving the paperback covers :). Happy reading, your book haul looks delicious!